Claude Monet, the world famous French Impressionist master, was born in Paris but he was raised in Le Havre, in Normandy, where his talent bloomed. After Art studies in Paris, it’s in Honfleur, as a student of Eugene Boudin and Johan Jongkind that he discovered the “open-air” painting. This was a very new technique for the time, and the public, used to impressive antique or historical scenes, painted indoor, didn’t understand right away. The first years of Monet as a painter were hard : he and his family often didn’t have enough to eat. It did not matter ! Nothing could stop him. He was fascinated by the natural light and by the changing colors it created. His whole life was an attempt of fixing on the canvas fleeting effects, instants that are vanishing as fast as they appeared. Normandy and its changeable weather, where the sun alternates with clouds, provided him perfect settings : the clear and colorful costumes of the wealthy tourists on Trouville beach, the show of the sea and the cliffs of Etretat, the façade of Rouen cathedral. He finally settled in Giverny, a small farmer’s village in Norman countryside, with his family in 1883. He lived there until he died in 1926, happy and quietly enjoying the comfort of his life, once famous. He kept transforming his gardens to improve them year after year. 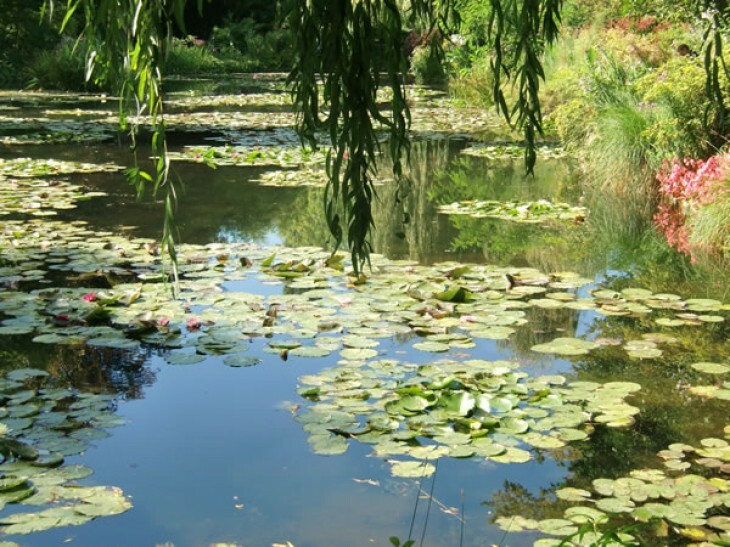 He also created the Waterlily Pond and the Japanese Bridge, his last subjects of painting.